In order to use Oracle Database, first of all we need to setup Oracle Software. 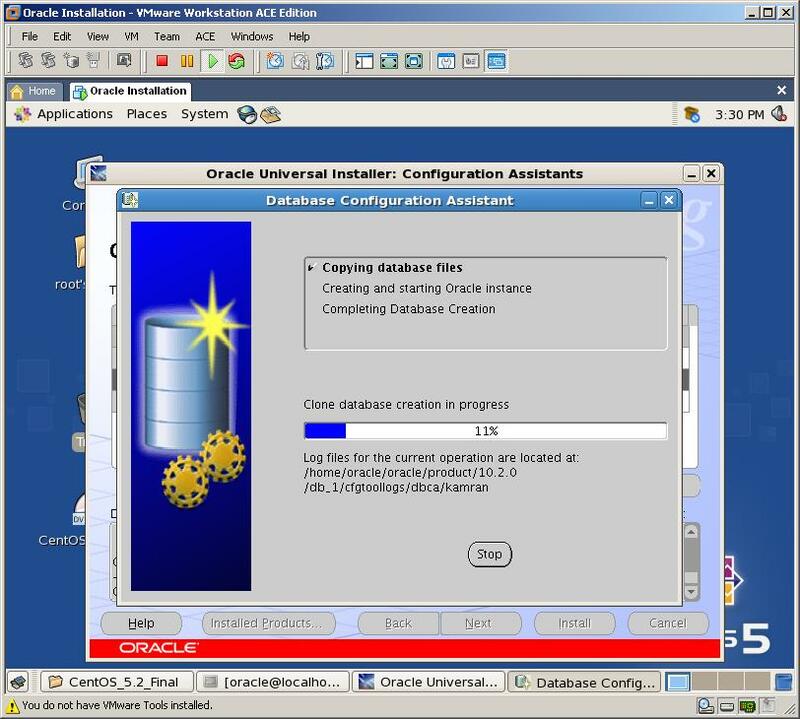 Installation of Oracle Database on Windows is very easy. 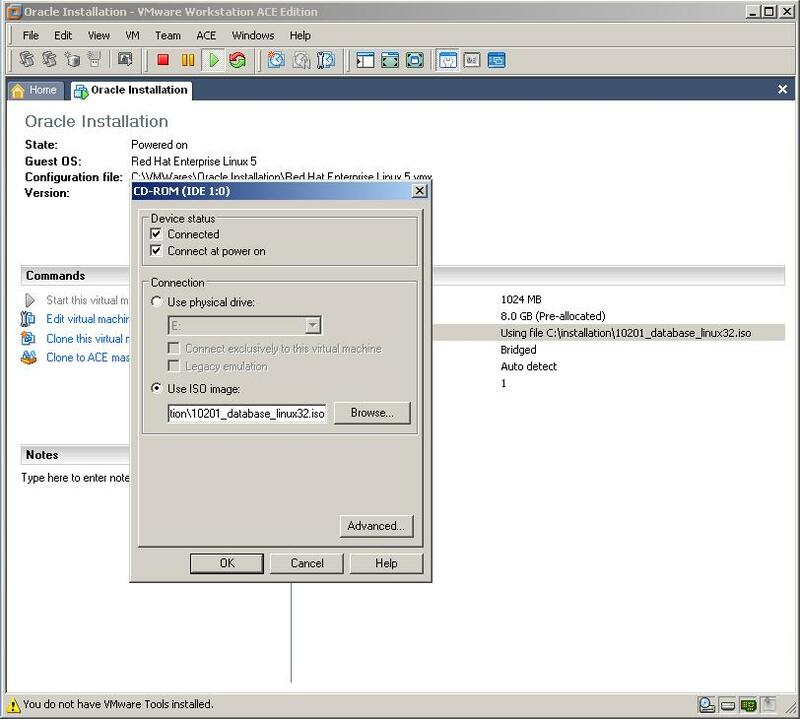 By running setup.exe from installation CD of Oracle for Windows, we can invoke a setup and by clicking NEXT buttons we can install Oracle Software and Database without any problem. We don’t need any prerequisite actions before installation. But in Linux it’s different. If we want to install Oracle Database on Linux OS, we should follow some prerequisite actions. But there’s one thing we should keep in mind. During installation of CentOS, on the “package lists” page, we should behave differently. It will be discussed in the next paragraphs. 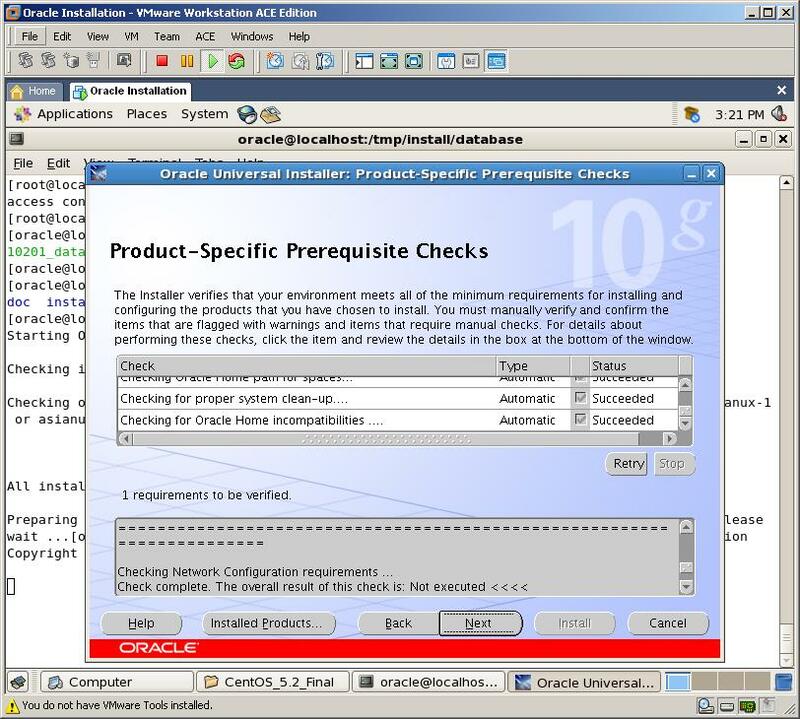 One of the first checks performed by the Oracle Universal Installer (OUI) is to determine if the host platform is supported. The OUI uses the file /etc/redhat-release to determine the platform. 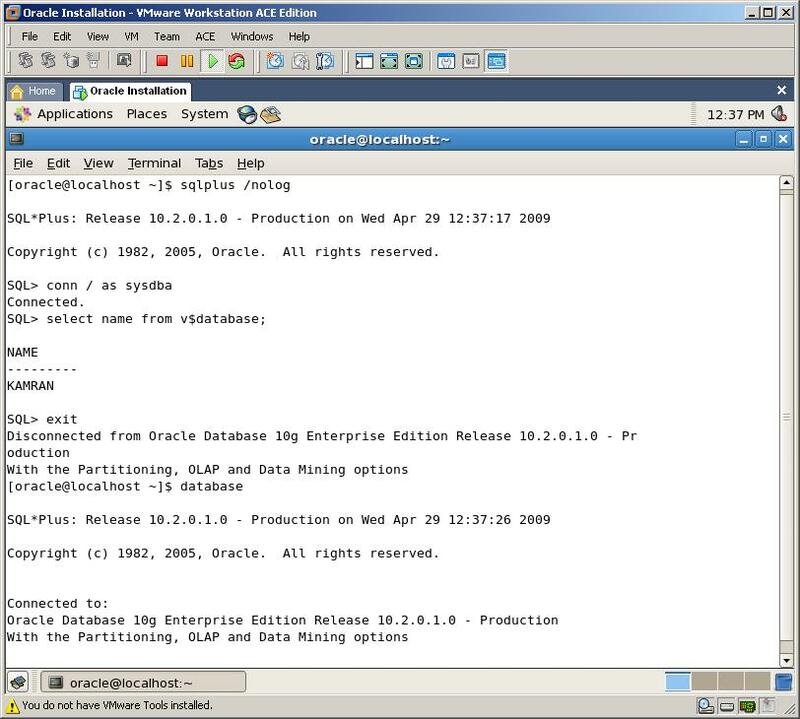 For the case of Red Hat Enterprise Linux, Oracle Database 10g Release 2 expects either RHEL 3 or RHEL/OEL 4. Before modifying /etc/redhat-release, make a backup copy of the file and ensure to replace the original one after the Oracle installation and patch process has been completed. Now enter to “Computer” and double click on “CD-ROM” icon. Here we see that all Prerequisite Checks succeeded. 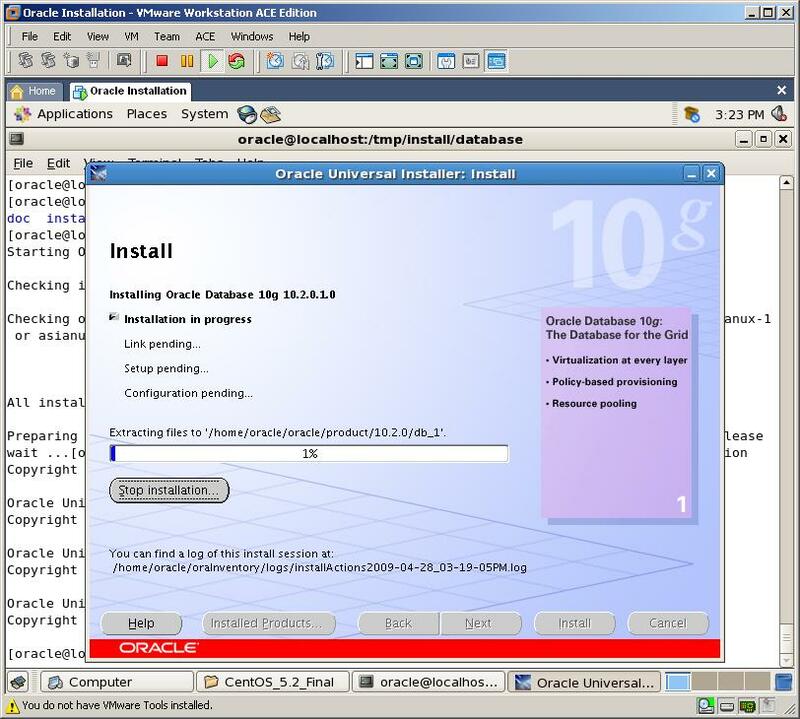 Now, we’re installing Oracle 10g Software. 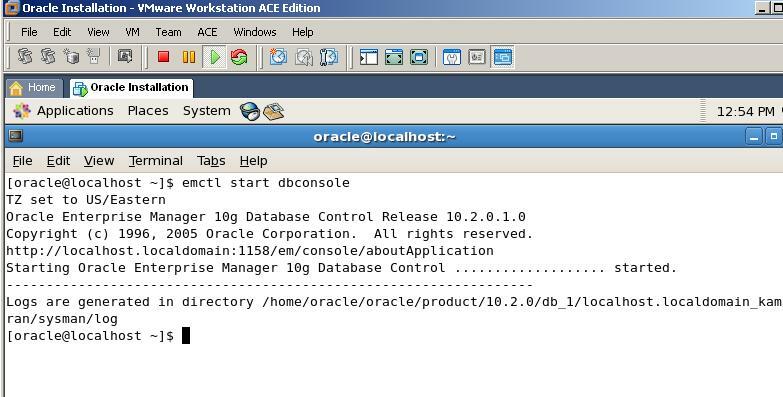 Installation of Oracle Database 10g completed successfully! Congratulations! 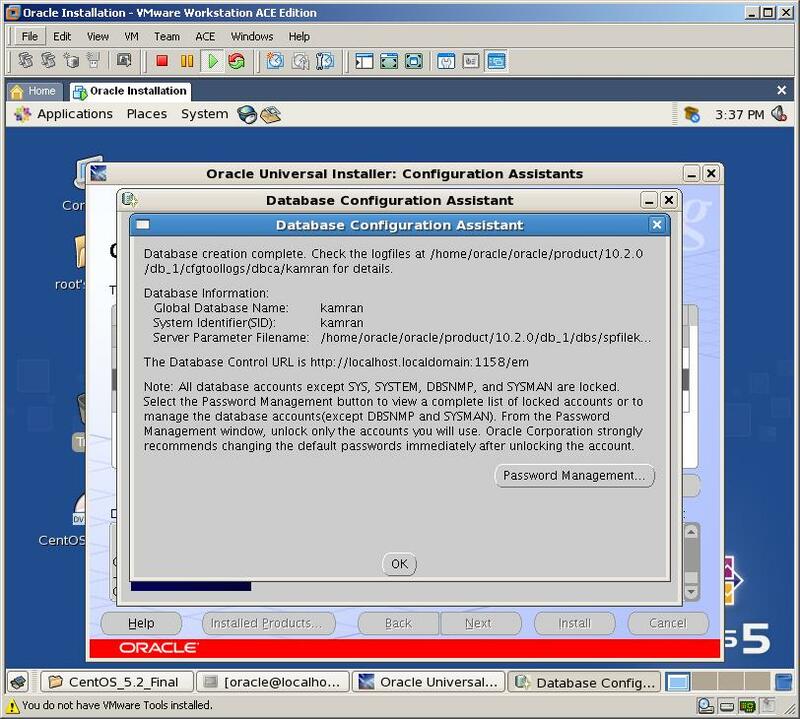 Now reboot your server and login as oracle user and start newly created database. As you see, after setting Environment Variables to their correct values, I was able to login to SQL*Plus using two ways. That’s all!! Our Database and EM is ready for use! Congratulations!!! Firstly, I usually create new Virtual Machine with 10GB size. 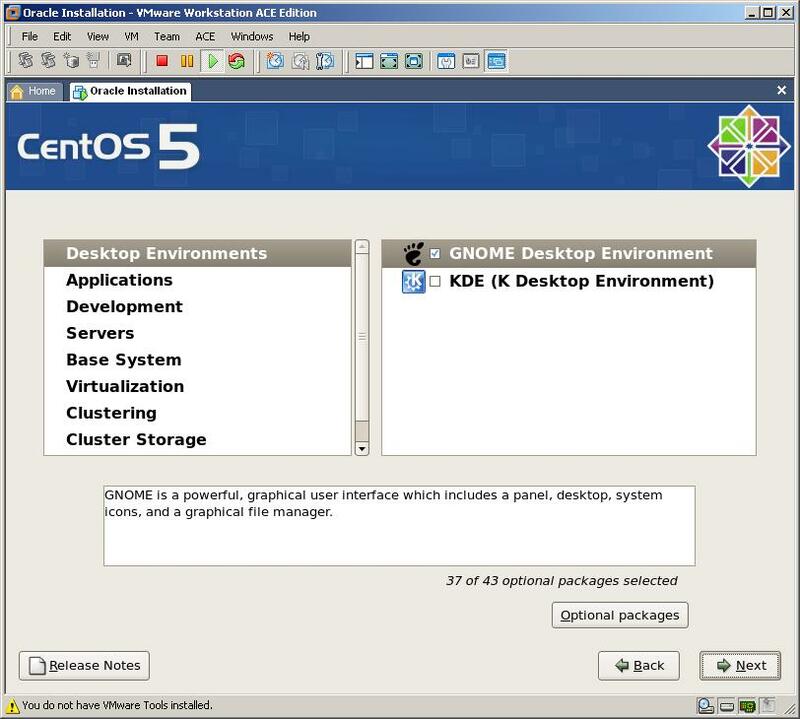 Then, I install CentOS on it and create an Oracle Database with all its configurations. Then I shut down Virtual Machine and copy all the folders to another directory. Usually, I create two copies of the Virtual Machine. Then I do all my tests on the first Virtual Machine. When it becomes useless, I shut down and delete it as a whole folder, open second Virtual Machine which I’ve copied and continue my tests. Second way is the best method of approach to the problem. For this, I create a shell script and write all steps and do all configuration changes from this script. 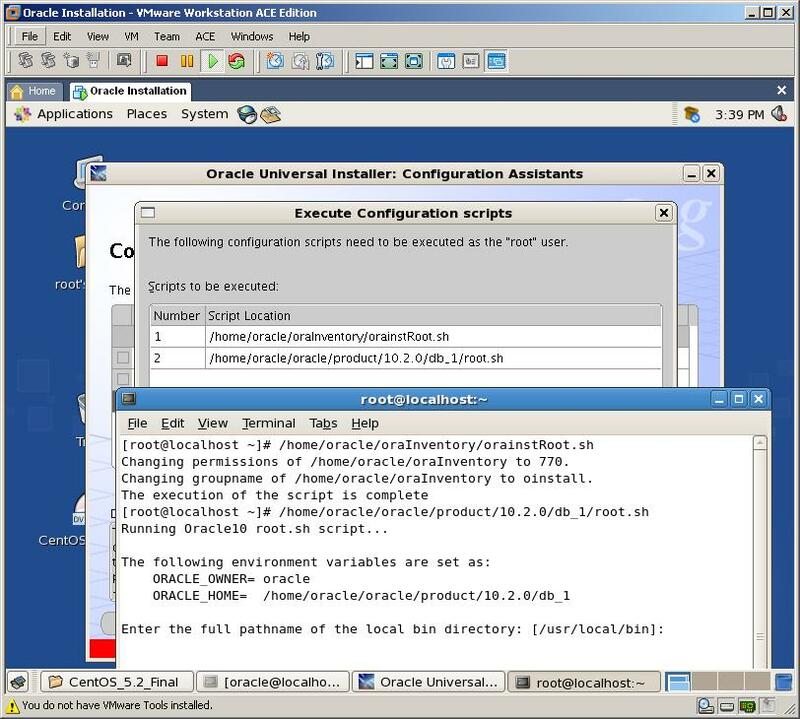 By running this script once, all configurations needed for Oracle Installation will be changed automatically and we will only be asked for new oracle user’s password and next we’ll see installation page open. That’s all! After getting this page, you should follow above mentioned installation steps in which we installed Oracle Database manually. This entry was posted on Friday, May 1st, 2009 at 10:14 am	and is filed under Administration, DBA scripts, Oracle on Linux. You can follow any responses to this entry through the RSS 2.0 feed. You can leave a response, or trackback from your own site. Onlari rpm -Uvh ile bir daha install etmeyi dene. 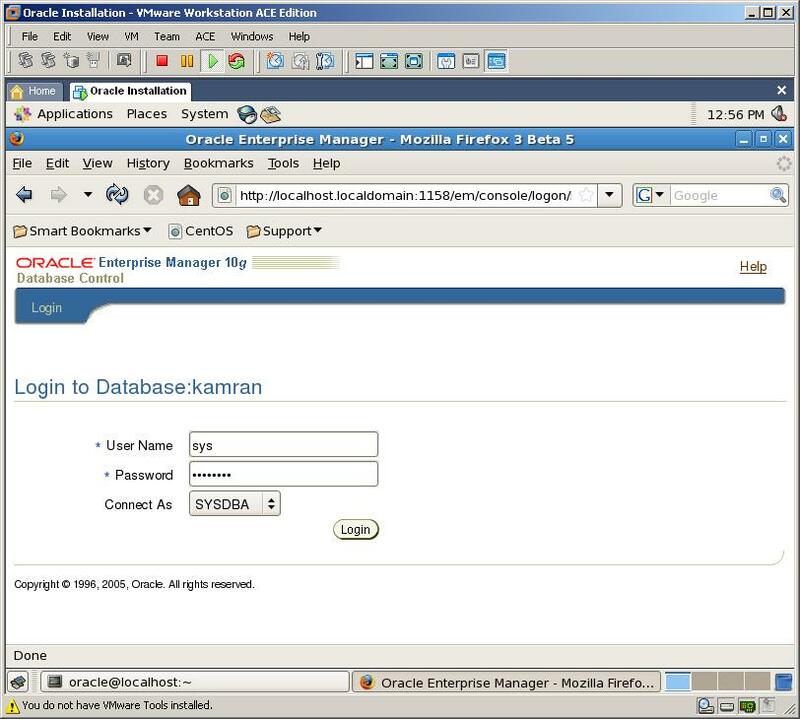 Amma senin Oracle Datbase-in normal kurulmushdur bence. Database-e koshulup calisdiqina baka bilirmisin? What a good and detailed guide. I have a question about the installation of Oracle 10g release2 on CENTOS. 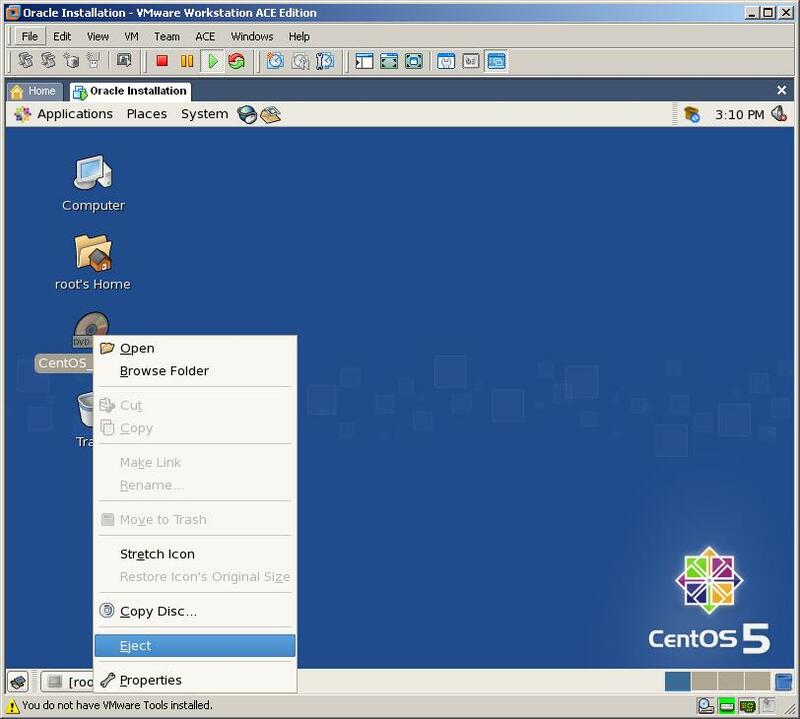 I have a Virtual server of CENTOS 5 and I am following the steps in your document. However when I try to run the installer I get an error saying that it can’t connect to the X11 window server. Is there a step that I missed? Hi Mariane and welcome to my Blog. It’s really wonderful about the articles you plblished in your web site. I have question like I was in SAP for some time not really many opp are coming I want to start my carrier as Oracle DBA on Unix – linux and I am hands on Unix and I have teaching exp as Oracle DBA long back 5 years ago about 1 year. What do you suggest like should I continue my carrier as Oracle DBA or not ? If so On which flavour of unix do u suggest….I do agree that Linux is available on free some time. Good post. Really helpful for all. 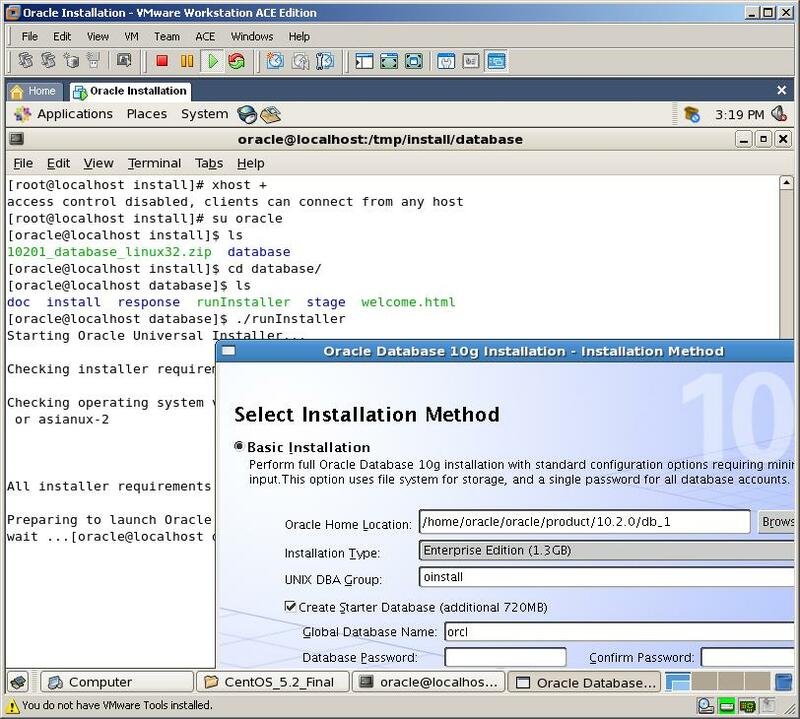 afew days back, I installed oracle database 10.2 on mac os server 10.5.4. I have some issues on that. Did you installed oracle ever on mac os ?? I gone through this article long back. Great tutorial! Thans a lot brother! I did not find HR user created by system by default. Can you suggest what will be the possible reason?? But all other schemas are available excluding HR. I will try to do it manually. Just small corrections on 4th steps (groupadd) above, to remove -g option. The script is already correct, without -g option. i followed all steps in your blog, and done installing oracle on my computer with no error. but when i tried to open em(i already started the listener), there’s an alert said “The connection was refused when attempting to contact basdat.ittelkom.ac.id:1158”. i dont know, maybe the network parameter is incorrect(im using static IP address), but i just dont know how to fix it, since im stil new to RHEL environment. I am looking help on how to setup primary database and standby database. how to sync and failover . pl advise. I’m very happy that you were able to install Oracle on Linux usint this article. i think last time i installed oracle, i forget to start dbconsloe, hehe, and also something with .bashrc file, i just dont understand, my bad. thanks again for the explanation, and for the link too. 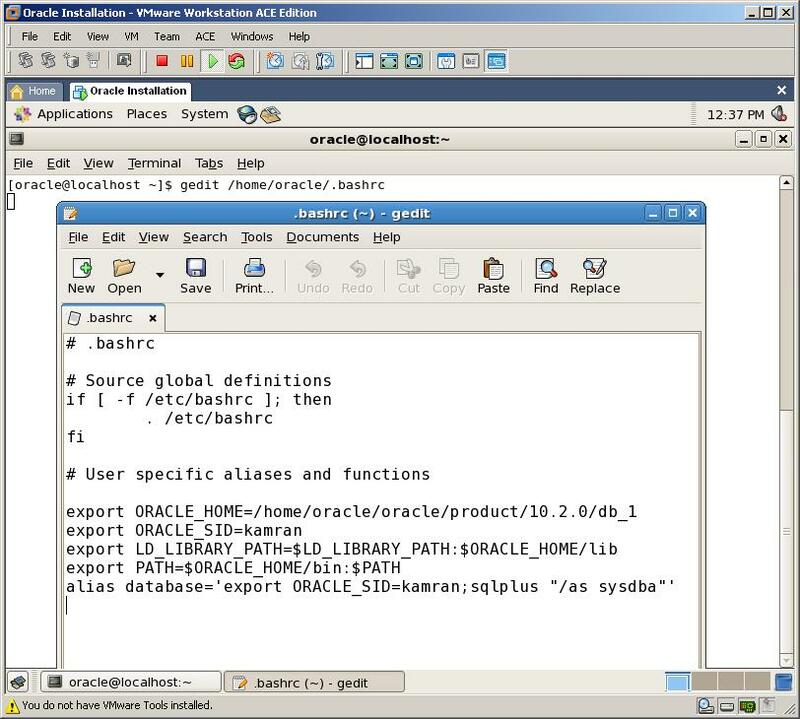 I have oracle database 10.2 running on mac server 10.5.7. Now a days, when I start database manually it took more time to start. However there is not huge data in my database stored. Can you tell what is the possible reason of delay to start. Hola Kamran Agayev, solo quiero decir que la guia es EXCELENTE. Muy buena. ¿Como puedo definir un ORACLE_SID? No me funciono el EM, porque no tengo definido el SID. How can one define ORACLE_SID? I do not run the MS, because I do not set the SID. Thanks men it is really help full for me .. Once again thanks a lot ..
It’s really wonderful about the articles you published. It’s really help me to understand how to install oracle on linux. I am desperately searching for this type of document. I followed all the steps which you mention in the blog. I successfully installed the Oracle 10g on Linux. But I got one error after restarting my Laptop. ORA-12505 TNS:listener does not currently know of SID given in current description. According to error you get, you need to shutdown the database, shutdown the listener and Enterprise manager. Then open the database, listener and Enterprise Manager in these steps. You should open Database firstly, then listener and then EM. Doing that way, you’ll be able to start Enterprise Manager without getting any error. But i am not able to shutdown the database.I am not able to login in SQLPLUS with SYSDBA. And i have a small query sir. I want to create another database on same host.It can be done with dbca command.But how can i configure it to run on linux?? And also how can verify the number of database running on host with sql query?? Once again thank you very much sir for your prompt reply. I donot understand what is the problem. Great Great Article, Good Job. 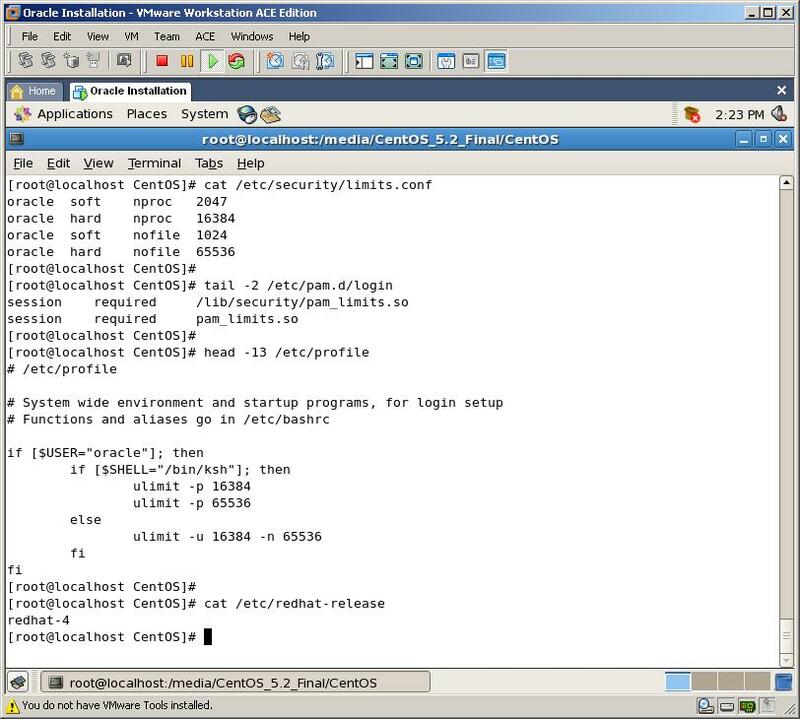 I was able to install oracle on Linux (CentOS 5.2) and got it off the ground with the help of Kamran’s Step by Step Guide. Ok sir i will do that……. But i want to thank you once again for this wonderful article & also your help. 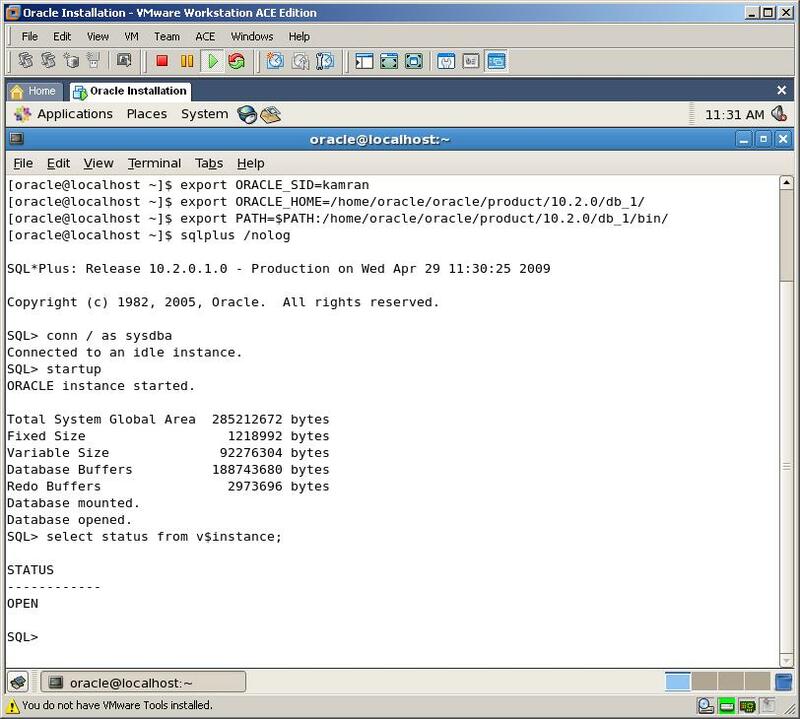 I have install Oracle 9i on Redhat Linux 4. I am not able to user isqlplus through mozilla. Is there configuration needs to be done. I have checked all the services like http,listner etc. Please help me I am not getting solution..
Hi Tnks for sharing your experience can yo help my about step by step install physical standby white rman? Nice article with lot of knowledge. Thanks a lot. Salam!zehmet deyilse mene komek ede bilersiz.men linuxa teze baslayiram bele 1 problemle uzlesmisem.oracle install etmek ucun gosterdiyiniz emrleri etdim bu sehvi verdi.mumkunse komek ederdizde.cox sagolun! There were errors encountered in trying to update the software you selected. Bu xetani hansi seviyyede almisan? I just came across your site and am very delighted! I want to be part of your discussion group! You’ve done and are doing a great job! I noted that you did not address the network aspect in the during the above installation of Oracle. I know you mention during the creation of VMware machone you use a bridged network. Is it enough for the Oracle installation? i am preparing for OCP and oracle on linux certification. 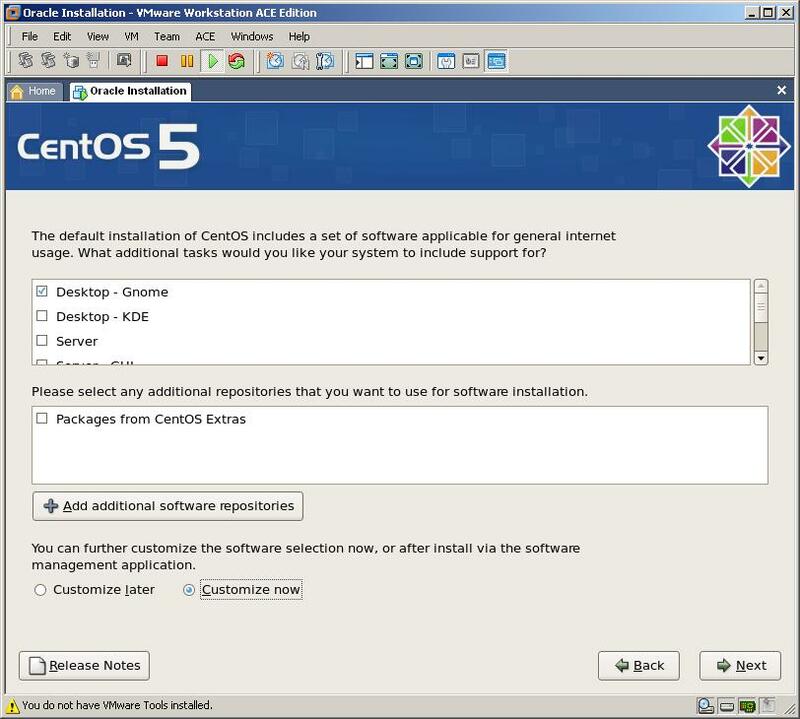 I have one inquery, If I install CentOS 5.4 64 bit version & Oracle 10g for Linux 64 bit, is this the same ? I guess it’s same except they need different set of prerequisite .rpm, if it’s so, what are they ? I want to tell you that I was installing oracle on linux since 10 days but by reading your tutorial I installed and configured the oracle settings within 10 mins. So you might be knowing how HAPPY I might be. but this dint work please do tell me how to set editor.. I am very happy beeng a student of Kamran Agayev……! what are the specific prerequisites .rpm for Oracle 10g 64 bit on CentOS 5.4 64 bit ? I just look at this link but it doesn’t relate to 64bit platform specifically, could you please explain why !? guess I can use them also for the new versions, CentOS 5.4 + ORA 11gR2…??? to we really need them all? Its an excellent document. I like your blog. I will stay in contact with you. I am total novice to CentOS as well as oracle. 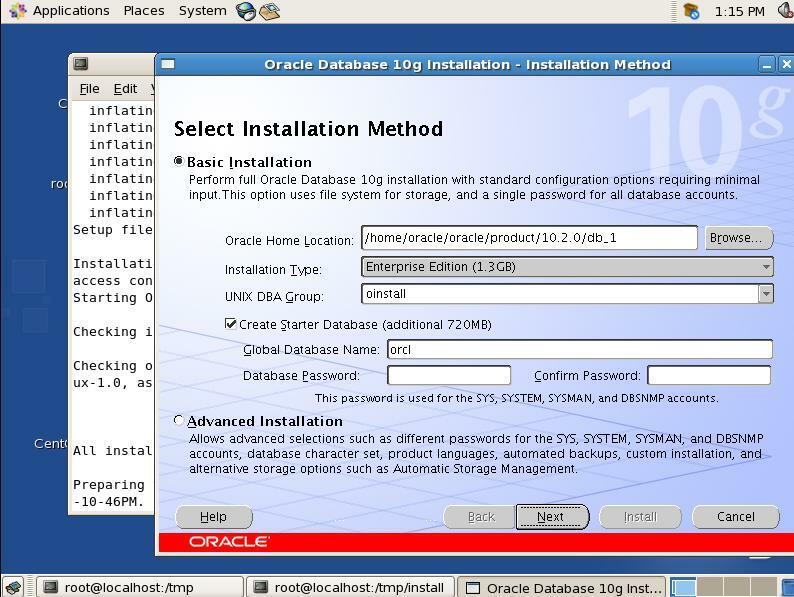 Just by following the steps mentioned here, I was able to successfully install the oracle. Thanks a lot and keep up the good work. Thanks again. Actually I am doing My academic project so I need to Automate the VM installation and creation of VM and also load mysql on that VM and test the query using Mysql benchmark sysbench. can you give some instruction to Automate the above process? Redhat EL5 ve Oracle 10g kurulu makinada rman ile ibm tsm üzerinden tape e bakup almak istiyorum. 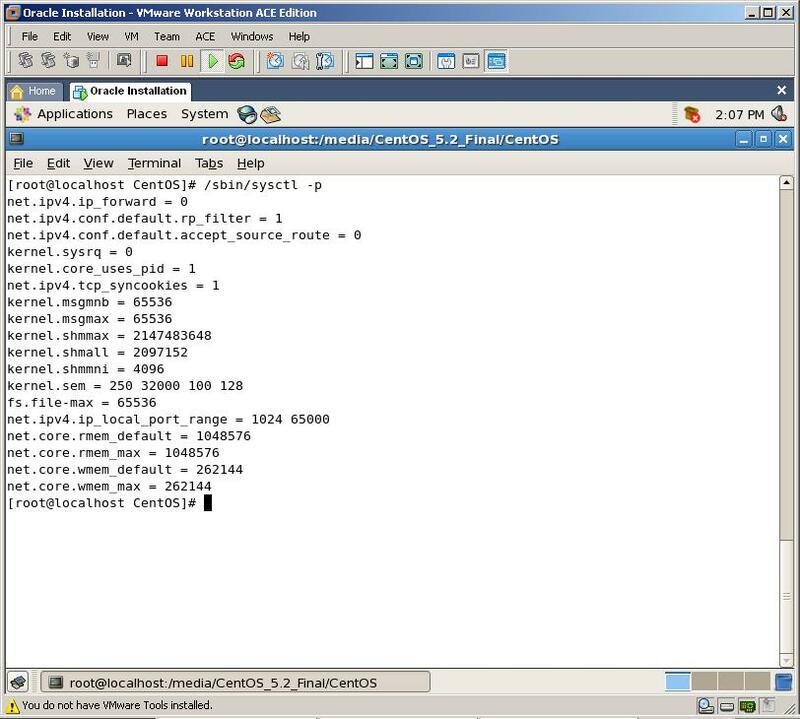 WARN jdbc.ConnectionCache _getConnection.306 – Io exception: Then Network Adapter could not establish the connection. I checked to make sure that I have my firewall and virus control off. I am thinking that the issue may revolve around the connection method. I will review the information that you provided on DHCP connections as this is currently my set up. Any thoughts? Can you give some instruction to Automate the VM machine ? like power on machine. after power on I want to launch the window that already power on.I did the power on process using the VIX api and Still I am struggling with launch the VM machine window. can u give some instruction how to do that? thank you. 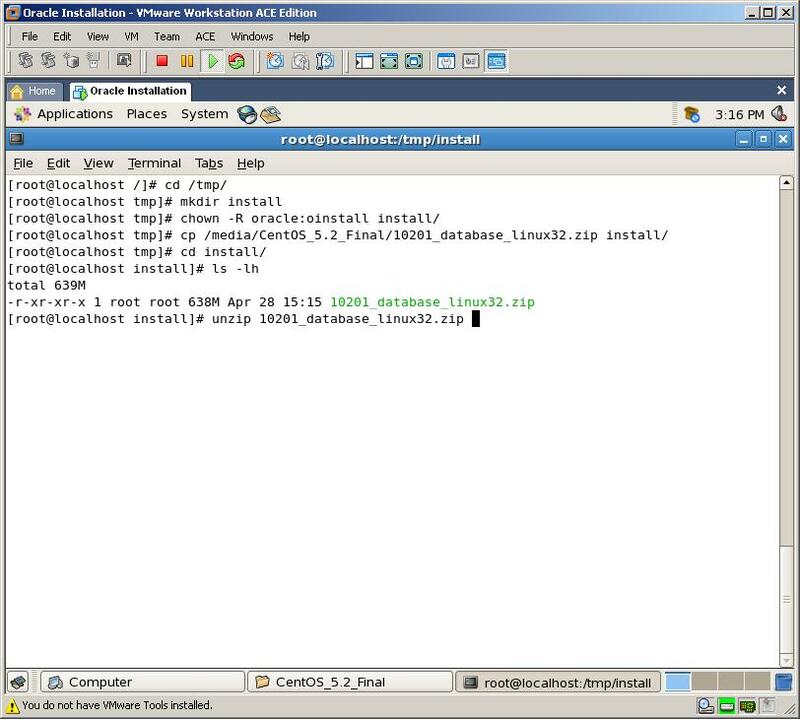 Why I send you this because I saw your post like step by step to install the VMware.so I thought like that you can help me.its ok. can you give some instruction that how to automate Mysql server installation using shell script in linux? This is a very very helpful post. 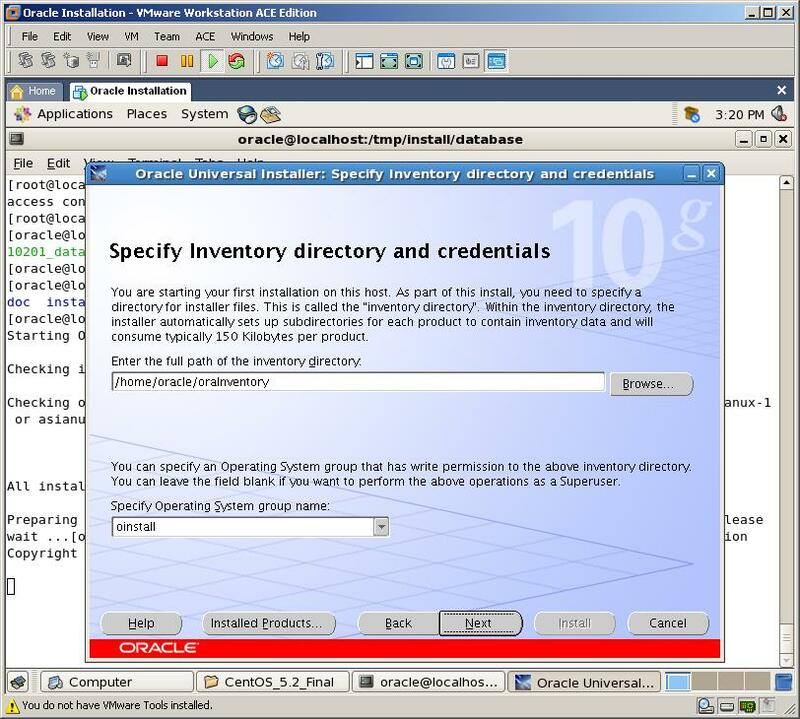 I am installing Oracle 10g R2 on Centos 5. I followed all the steps but when I write ./runInstaller I get following error. Kamran I would be really thankful if you please help me in getting rid of this error. Can you post some articles on how to do patching and upgrading from a version to another version. i have some doubts about the upgrade. Thanks for the wonderful articles, i liked the Rman series a lot. To know your ORACLE_HOME view the inventory.xml file in your ContentsXML directory. Thank you so much, Kamran. 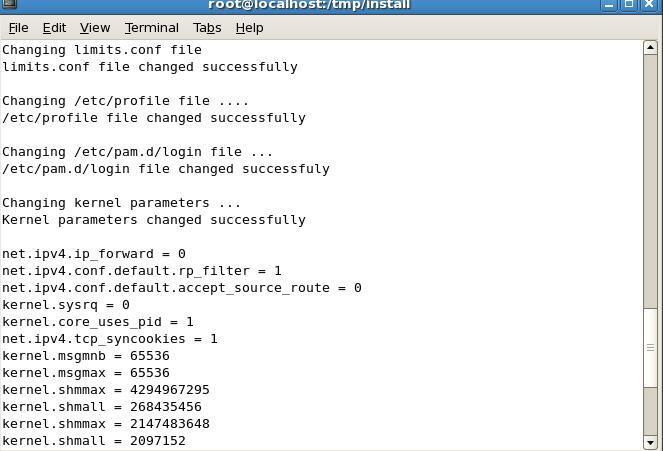 This xhost + command under root user saved my day! ok, thank’s mr. Kamran… i will try again. Thanks for the instructions Kamran! I am glad to find ur blog. I have started my career as an Oracle DBA. Can you please give me suggestions and share some of ur experiences in this field.Looking forward to hearing from you. for this re-installation which packages must be uninstalled and witch packages must be installed again? I was confused because there are many packages that their names start with gcc with varios version! God bless you for your efforts. You are doing a great service to other humans. 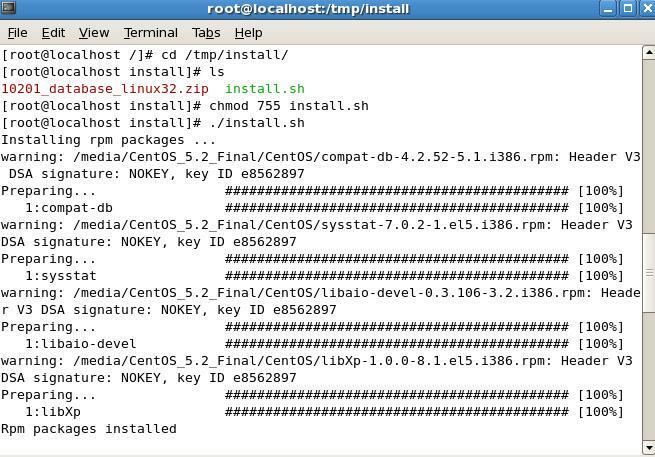 I am trying to install on CentOS 5.5. I am unable to install the following rpm’s, I get the error “no such file or directory”: I have installed the packages that you have listed. Maybe they have different version number in 5.5, your example uses 5.2. Could you guide me on that? Thanks for the reply. Infact, I went ahead and installed Oracle 10g without these 2 rpm’s, and it is running well. Can you share the real purpose of these rpm’s? sysstat – This package provides the sar and iostat commands for Linux. Sar and iostat enable system monitoring of disk, network, and other IO activity. libaio-devel – This package provides header files to include and libraries to link with for the Linux-native asynchronous I/O facility (“async I/O”, or “aio”). I can sucessfully install oracle but when I choose “install software only”. Now when I use dbca to create my database, dbca window appares and I choose default options, but when I press Finish button it doesn`t work without any error! only it remains on screen! Let me know if you have any idea. dbca does not create database and event does not report error! when I press finish button to start database creation in final wizard page , it does not any action and this page remains on screen without any error ! Is there any log file? or do you have any idea to find the reason of this problem? 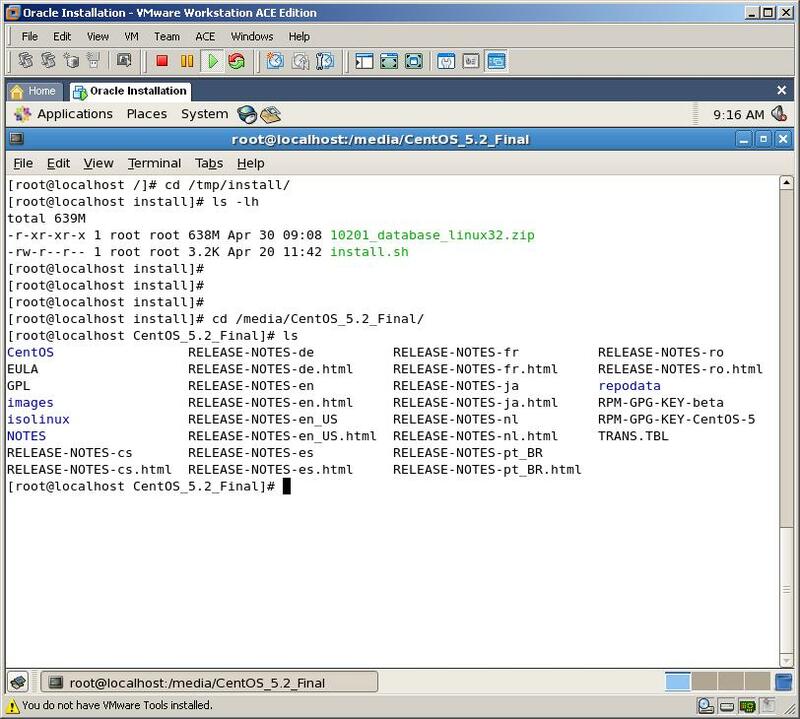 I have a query that i have linux RHEL 5 installed on my machine and while installig Oracle 10g it shows that i should install a lower version of LINUX like Linux 2,3,4. Can u help me out with the installation process. 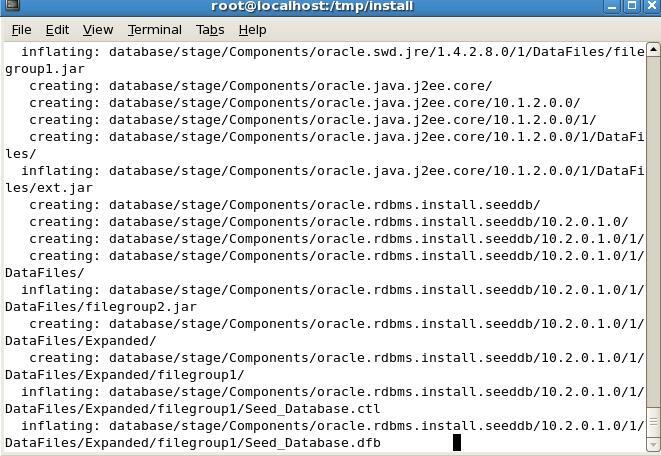 It will be really kind of u if u give me the installation steps of installing Oracle 10g on rhel 5.
on my PC. Actually this was a bit difficult task for the beginner like me. installed successfully with little changes. I m very much thankful to you. Please keep on this good work. It is very helpful for the beginners like me. hi i followed your steps. i am using xp and am booting linux fedora using vmvare. Cause: None of the known and available service handlers for the given SERVICE_NAME support the client’s protocol stack: transport, session, and presentation protocols. öncelikle böle bi blog oluşturduğun için teşekkürler.Ben senin anlatımınla centos üzerine oracle yi kurdum.Şimdi bu oracle yi canlı sistem olarak düşünürsek içindede datalar var diyelim.Bunun bi kopyasını nasıl test sistemine alabiliriz. 10201_database_linux32.zip.zip, and cannot find 10201_database_linux32.zip.ZIP, period. Şimdi ben dün bu iletiyi sana yazdıktan sonra bu serverin imajını aldım.Gittim bu imajı başka bir serverda çalıştırdım.Daha sonra bu imajı çalıştırdığım serverin hostnamesini ipsini değiştirdim çakışma olmasın diye.Sonra listener.ora ve tnsmanes.ora dosyasının içeriğini değiştirdim.SOnra database i ve listeneri çalıştırdım.Sorunsuz çalıştı.Acaba bu şekilde clonu çalıştırsam canlı sunucuya zararı olurmu.İyi çalışmalar. Bu sekilde clone calistirirsan canli sunucuya hic bir zarari olmaz. Sen imaj derken, Oracle imaj mi aldin, OS imajmi? OS imajı aldım.İlk defa aldığım için takılıyorum kusura bakmayın. I like you web site thats why its very interesting a had got a lot of good idea on you site about oracle. I am Sys and net admin but wanna learn oracle by exatly. How can you help me to learn oracle? This is a good one again. Sir I need help regarding installing more than one database on a single Linux server(RHEL5). Can you please help me on these. Thank you for your help. Along with this I would like to know whether I will create multiple homes for multiple databases while using dbca. And I would like to know about the .bash_profile entries also. Sir, I want to be little bit clear regarding this. Kindly help me sir. i followed you blog steps to install linux and oracle but i got stuck on step . when i m entring this commend all help related to useradd will open there . i m not ggod with linux please help me what is wrong there . 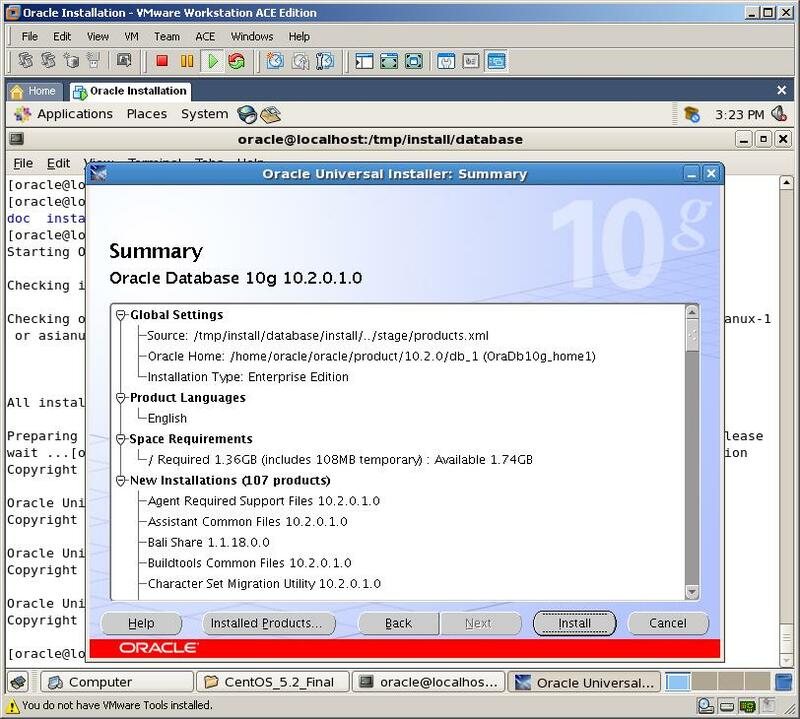 I am installing Oracle 10g rel2 on Linux with CentOS 4.8. 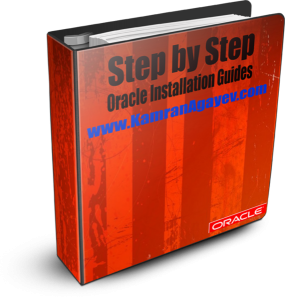 I am on step 2, Installing rpm packages which are required for Oracle installation. I don’t have access to the CentOS installation disk, so instead, I downloaded the 4 rpm files off the internet. Any ideas why? is this because we use CentOS4.8 and you were running CentOS 5.2? Any pointers on how to solve this issue would be greatly appreciated! 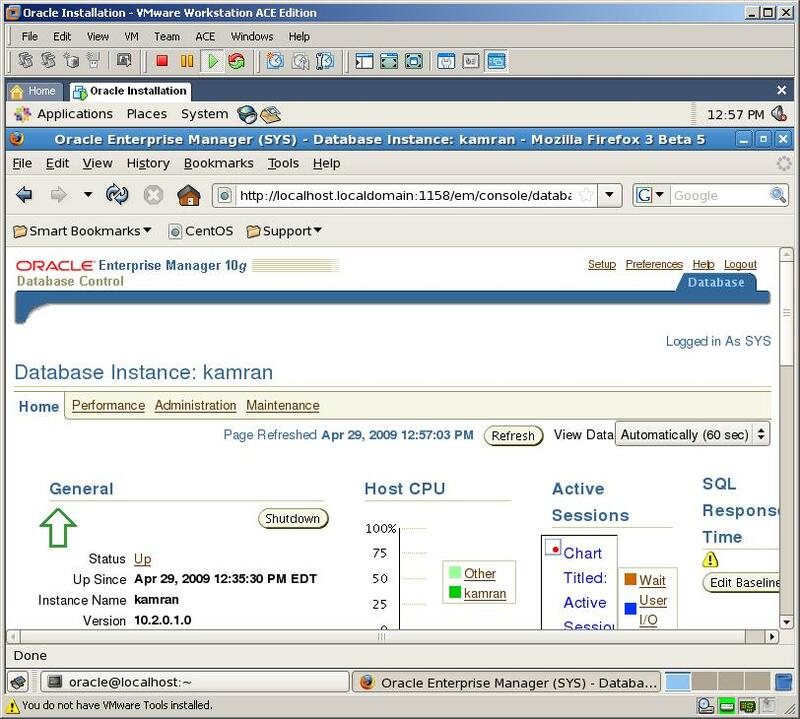 HI, KAMRAM, I’M FROM ARGENTINE AND I’M ORACLE DATABASE ADMINISTRATOR. I READ YOUR ARTICLE AND IT SEEMS VERY GOOD!!! AT THIS MOMENT, I ADD YOUR LINK TO MY FAVORITES. Yes that was the solution. Additionally, I am using Oracle VM VirtualBox & therefore wanted to share my solution for Step 5. In terminal I did "yum install gcc" successfully. Is this the fix for [WARNING 1] or do I need to do something more? Is the fix for [WARNING 2] (Checking Kernel Parameters) simply to edit the sysctl.conf file by adding rmem_max = 262144 or do I need to do something more? Is there something I can do in the terminal to fix [WARNING 3]? Which Forum/Category in OTN Forums should I ask future questions about Oracle10g on CentOS (I am sure I will have many more) Database-Installation or Server & Storage Systems – Generic Linux? Wanted to inform you that I was able to overcome obstacles and am now ready to use Database & Enterprise Manager. I was lucky to find your blog, as I am learning both Linux & Oracle Database in College. This blog was like a Rosetta Stone for answering many of the questions I had regarding both! Trying to learn Oracle Database in a Windows environment is frustrating to say the least. I am much more comfortable in a Unix like environment, and will go on to your Solaris step by step tutorial next. 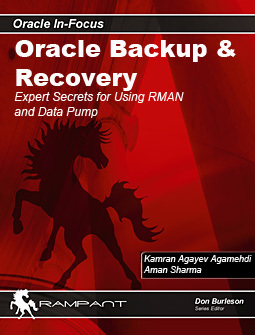 My college textbook (Oracle 10g Database Adminstrator II – Claire Rajan) is geared towards Windows & while I have learned many things, I would like to know if your textbook “Expert secrets for using RMAN and Data Pump” would be useful for me now, using Oracle 10g R2 on Centos? A BIG THANK YOU! & looking forward to Installing on Solaris! Can you please help solve this issue. 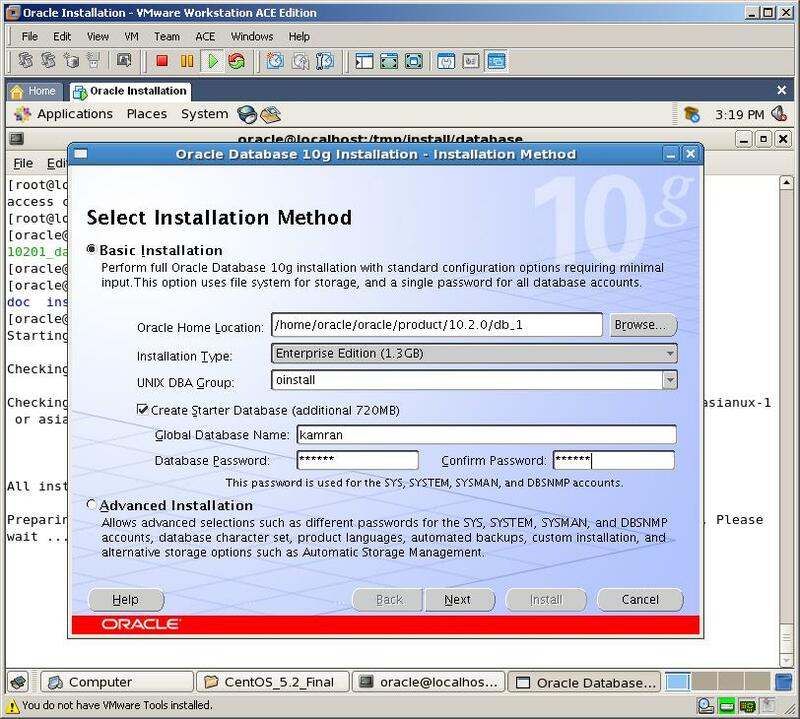 Do you have steps on how to install/configure Oracle 11g r2 on a Centos. I am also looking for configuration steps for ASM, and TPC-C database. Thanks! But I got one error when i create database with dbca; i have tried to rebuild the repository EM but get the same error. CONFIG: No se ha definido ningún valor para el parámetro ORACLE_HOSTNAME. Consulte el archivo log en /u01/app/oracle/product/10.2.0.1/db_1/cfgtoollogs/dbca/orakol/emConfig.log para obtener más información. 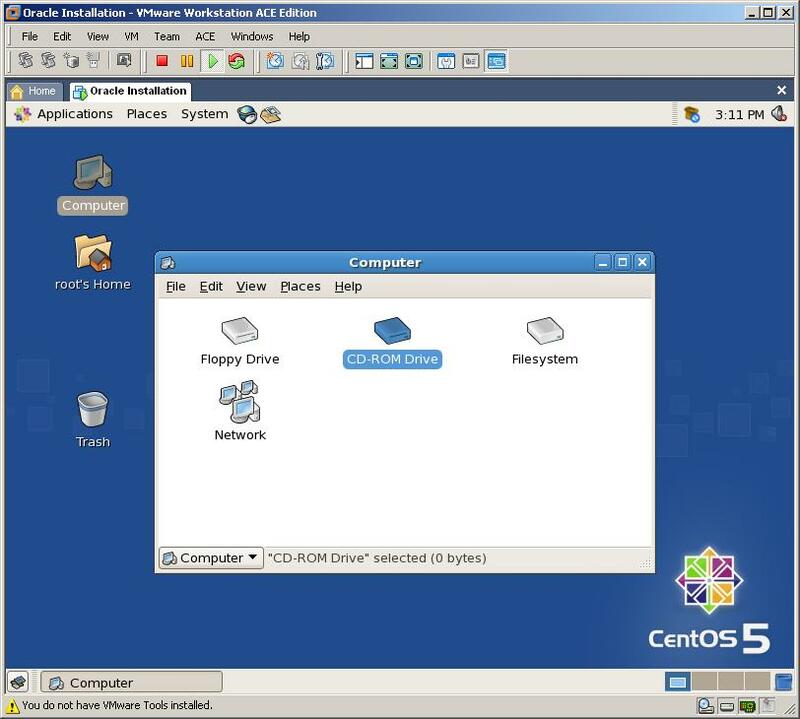 I have already installed centos on my vmware. Now to proceed with step 2 how to customize again. iam taking course for oracle DBA. i installed VM ware and red hat linux 4 in my laptop.when i installing oracle11Gon LINUX s/w ,after ./runInstaller command ,it is showing error like ” checking recomended glibc version failed” .so wat is the solution..help me.. 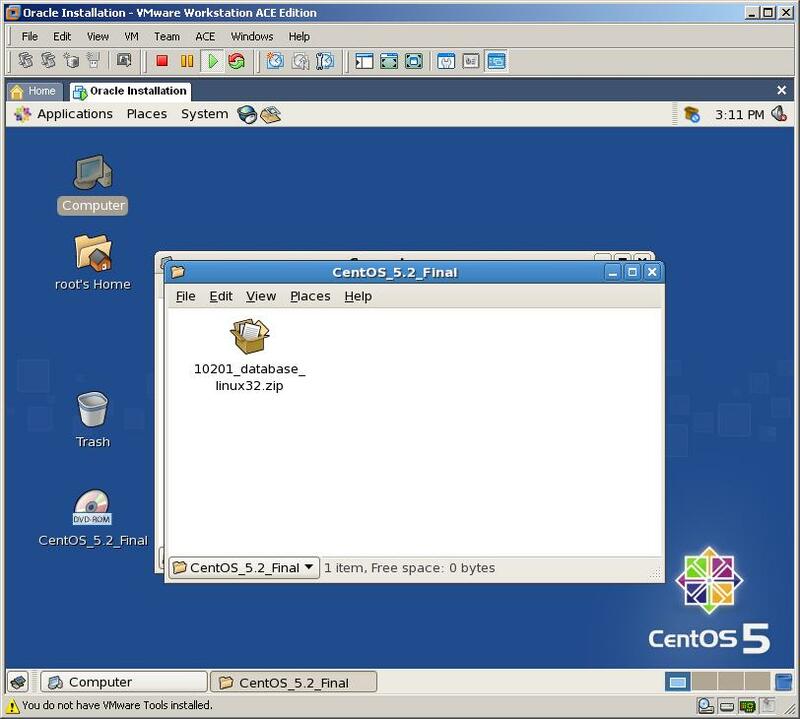 I have aleready installed centos on vmware. Now to proceed with step 2 how can I customize again. I had read your artical its very good. I have same dout about “How t create ASM instance and database” in window 2003.
how should I proceed. Can you clearly explain me how to install the packages that you have mentioned. Thank you for immediate reponse. 1)how to check whether the required packages are installed or not and where will be this rpms folder. 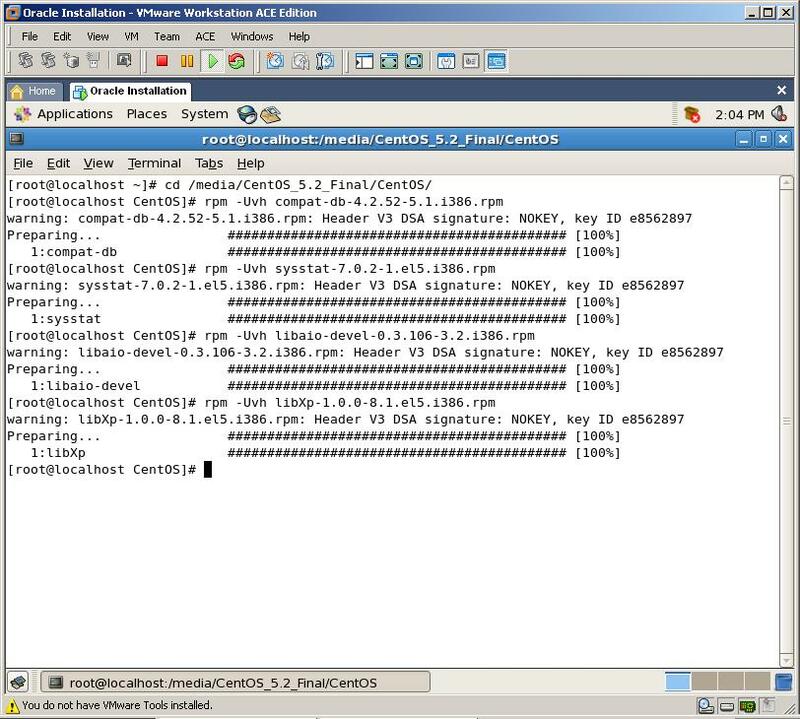 2) I have installed centos5 from the screen shots you have given. when I need to install the rpm packages do I need to download separately and install them. can you describe me the brief steps to install the rpm packages. so far I have wasted lot of time to install these packages and still I am unable to install. Can you help me,Kamran ? Have you set environment variable before logging to sqlplus? Wow man! You are my GURU:)!! Thank you so much for the fantastc video! Can you tell me how to install database sample to perform the examples in Oracle ‘s books and related documentations ? 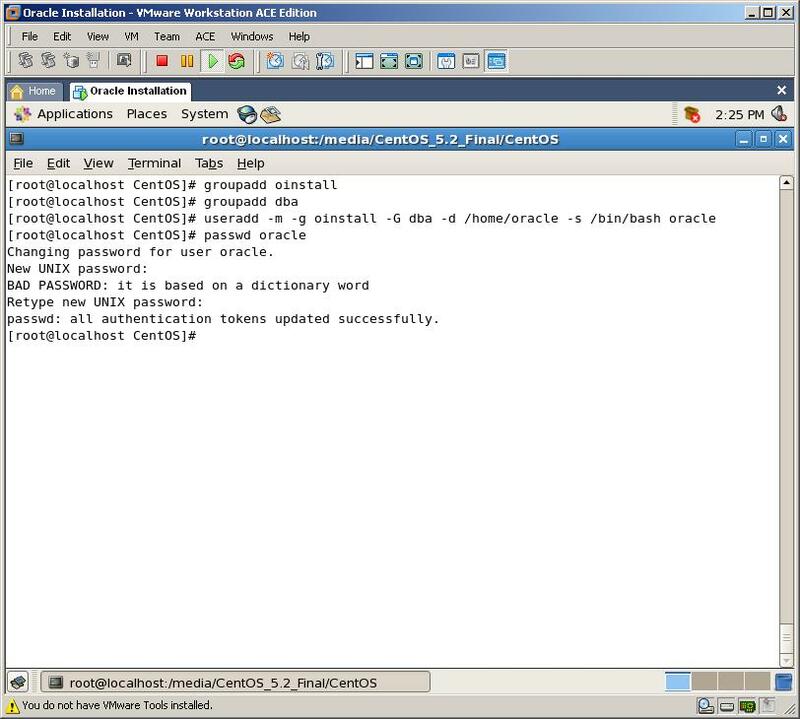 I am trying to Install Oracle 10gR2 on centos 5.5. But I have pre-requisite check errors “Installation not supported”. Is 10gR2 compatible with centos 5.5? Kamran, i’m getting the below error. Any suggestion please? i am having a liitle proble. i follow all the steps but at the time of installation after ./runInstaller blue window appears. here in my installation the unix dba group appears only root and oracle not oinstall if i type oinstall . In next step it again ask for user and if type oinstall it shows error. In you installation it outomatically apears oinstall but in my i have to mention it. which finally leads to error. since last three day i tryed several time but result is same. please help me i m wating for you answer. i tryed installation again i a got all the steps right but in product prerequisite checks i got expected result 922 mb and actual result 568 mb. physical memory requirements. can u help me out here how to sove it i have 14gb red hat vertual machine. by copying init.ora file to initORCL.ora. I have exactly the same problme as Moslem Rashidi explain in comments 118 and 120. “Now when I use dbca to create my database, dbca window appares and I choose default options, but when I press Finish button it doesn`t work without any error! only it remains on screen! it’s describe exactly my problem. I try to install an Oracle 11g R1 on a AIX 6.1. You advise to check the $ORACLE_HOME/cfgtoollogs/dbca/ folder but i don’t have any dbca folder in $ORACLE_HOME/cfgtoollogs. I know your article is about a Oracle installation on a Centos system but maybe you should have an idea to solve my problem. thanks for all but can u help me in my problem…i do all of the above but when i connected to database in different server and make aselect statement it get ??????? yukarıdaki kurulumu örnek alarak oracle sistemimi kurdum.Gerçekten güzel çalışyor.Ama 32 bit olduğu için 2 gbden fazlasını kullandıramıyorum sisteme ramın.Bundan daha fazla ram kullandırma şansım varmı veya 64 bite migration yapmam için nasıl bir yol izlemem gerekiyor.Yardımcı olabilirmisin.Teşekkürler. this removed all but one of the makefile errors in installation. This other one can be ignored (so I found on another site post). Make sure oracle is in dba group. 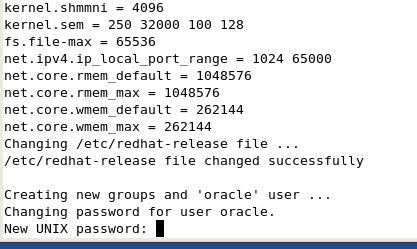 This allows oracle to use the hugepages feature and gets rid of the shared memory error when trying to start oracle. Hi SYed. What error you get? Have you configured listener.ora and tnsnames.ora correctly? also for the install, permissions seem to be incorrect for both the lib and lib32 directories and contents. Fixing this solved all sorts of exceptions like not finding libnjni10.so. Also, PERL5LIB environment var will need to be modified so that it finds the .pm files in the oracle directories. These were all set up at install time so that if you run them with the oracle account, all is fine. If other users run them they run into these permission issues. Not sure why oracle’s install did this. during oracle application (10.1.3 )installation, i faced there error. i have alredy set redhat-4 in /etc/redhat-release and /etc/issue. Thanks for your efforts. I really appreciate and got inspired. Do you have any issues in record ? Thanking you for your great help. Terrific blog. Thanks for sharing your knowledge. I followed the steps for installing 10g on Linux 5.7 on vmware. I am stuck at installing the rpm packages. I have trouble with the following. When I run the command, it says no packages have been installed and when I change the directory it says no directory found. I have googled and reaseached to get help but not succeeded. Can you please explain this step further? I did but it the four packages you mention aboe are not in that directory. There are rpm packages there but not the four you mention. What do you suggest??? I am using 5.7 instead of the 5.2 that you have. Could it now be in a different name? and my sceen gets hanged. from this i can understand that some rpm packages were missing so when i started to install from iso files i could not find the packages. how can i install the packages from .iso file i could not find any rpm folder in the cds.can u please give some info regarding this please. I am trying to become a oracle DBA soon. I am trying to practice on vmware worksation. Now next step I am told is to DL software and create a DB right? I am using redhat 5.1. Firefox can’t establish a connection to the server at casio.com.in:5560. Have you started isqlplus process? Great tutorial! I find it very helpful, you have explained everything!!! Kamran, very brilliant article. Thank you so much. Please keep your good work going. Thanks a lot. Allah razi olsun. Is it Possible to Install version 10.2.0.2 and there after upgrade it using 10.2.0.5 down below……….. 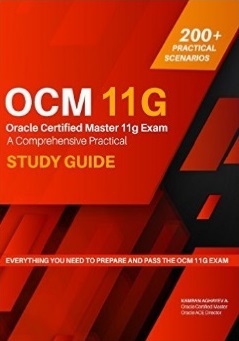 I am also trying to study and attempt Oracle 10g OCM after 3 or 4 Months..
Best of luck with your OCM exam. Have you checked my OCM article? Kamran, very perfect and brilliant article. Thank you so much.